Last week I had a final edit with one of my radio clients, which for a number of reasons was different to the normal 15’ or 30’ linear documentary. This project was for an educational establishment and they wanted separate clips that they could populate a web site with, or use in teaching sessions to play to students. 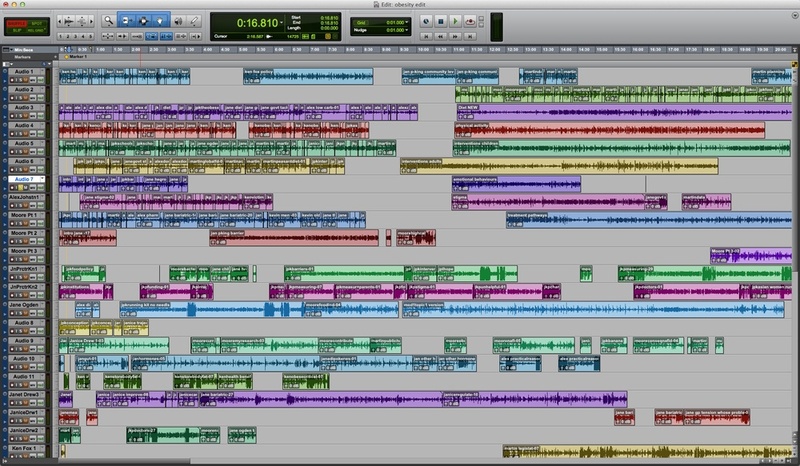 So my client edited all the interview content in one session with one or two interviews per track which ended up as a complex session as you can see above, so I adopted a completely different workflow to end up with the deliverables as they would need them. 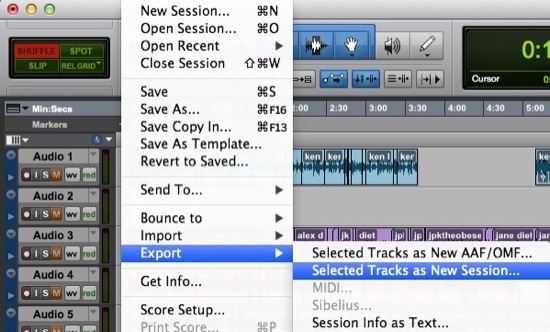 I quickly decided to use Export Selected Tracks as a New Session so that I could quickly and easily create a new session with just the edited content for that clip. Then I was able to work through and check and fines the edits and also use some plug-ins to improve the quality of the audio. 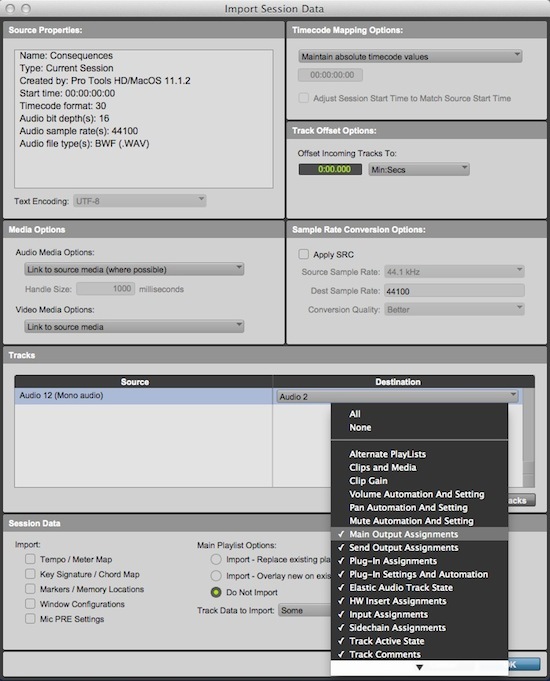 Once I had the plug-in settings from the first session, I used Import Session Data to import the track settings with the plug-ins and their settings, without the media from the original session into each of the new sessions. As the content was phone interviews, I used a number of plug-ins to massage the audio. I used the Avid Pro Limiter to handle the peaks and tame the dynamic range, then I used an Avid EQ7 to filter off the low and high frequencies and finally into my best friend, iZotope’s Dialog Denoiser running in Auto mode to clean up the background noise and hiss. I completed one pass doing the fine editing and checking that the plug-ins were doing what they should do, but there wasn’t time to do what I prefer to do, which is a real time bounce, listening all the way through. With the amount of content and the total duration the only way I could deliver it in the time available was to use Off Line Bounce. However I had heard the content all the way through on the fine edit pass so I could be confident that it would be OK. Finally I arranged all the content into sections and grouped it together in appropriate folders so that the team uploading the content would have no problem finding the correct clips. So Pro Tools 11 saved the day on several counts, the Export Track to New Session made it easier to create the new sessions, yes I could have used Import Session Data from a fresh session, but it was just easier in this project to use the Export option. 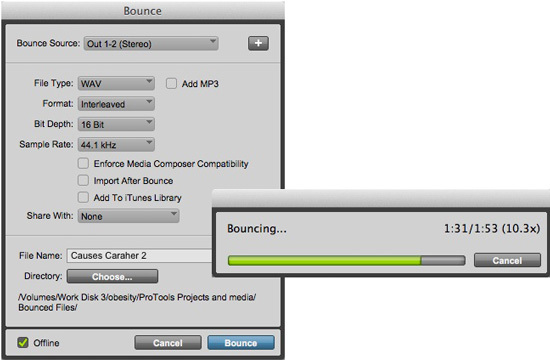 The Offline bounce meant I could deliver the content in the time available with an acceptable amount of compromise, and these kind of decisions are becoming more and more common as budgets decrease but the amount of deliverables increase, so thanks Avid for Pro Tools 11 and these new features, they made me look good in front of my client.